LCD Buyer purchases broken glass LCD screens from businesses across the United States. As part of the Clover family of over 19,000 employees worldwide, LCD Buyer is committed to making the buyback process simple and convenient. A dedicated representative will manage the process from beginning to end and ensure your ultimate satisfaction. Rest assured knowing you are dealing with a partner with the financial strength and security to support your business. Get paid in days, not weeks! With our team of expert tech specialists there’s no need to wait to cash in on your inventory. Receive a speedy payment by check, ACH/deposit, or PayPal! Our repair capabilities ensure maximum recovery rates. We have the essential resources to make sure that every LCD that can be refurbished, is refurbished. Use our specially designed LCD shipping boxes! Each box holds 120 screens. Safely place your LCDs into our slotted dividers with ease. LCD Buyer guarantees fast, free shipping via UPS on all orders of 50 items or more. Ship fast, get paid fast. Our prepaid LCD shipping boxes and printable labels make shipping convenient and simple. Our team of industry experts are working hard to bring you the best deals possible. Get the most out of your inventory, and get it fast! No matter how big or small your shop, you'll have a dedicated representative to manage your account. It’s personal with LCD Buyer. Our goal is to give you the best customer experience. Period. LCD Buyer guarantees fast, free shipping via UPS on all orders of 50 items or more. Ship fast, get paid fast. 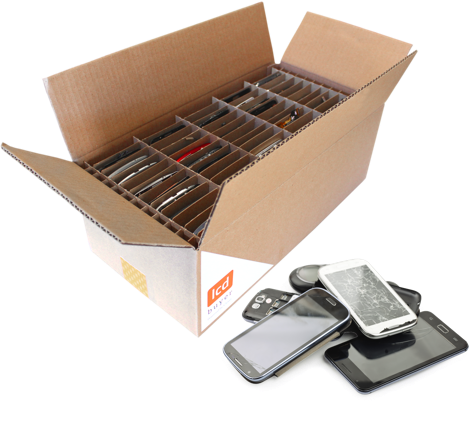 Our prepaid LCD shipping boxes make shipping convenient and simple.